uContact is an all-in-one call center solution that includes ACD, recording, dialers (preview, power, and predictive), CRM, WFM, quality, call reporting, live monitoring, IVR, SMS, web chat with audio and video, gamification, and many other features. 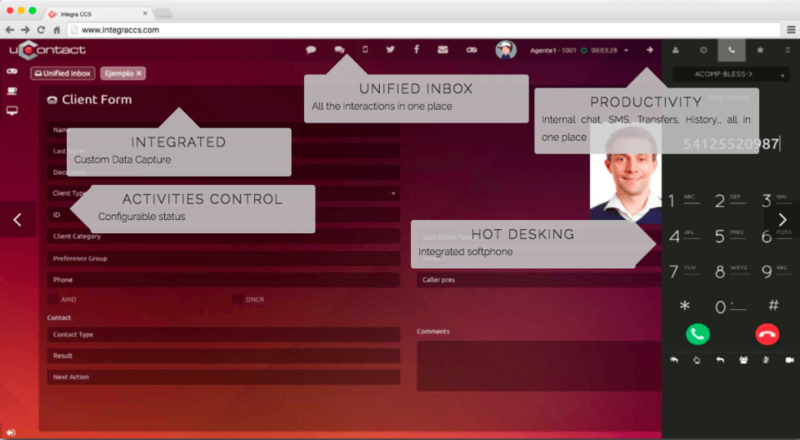 uContact features for agents include a unified multichannel inbox, 100% Web Agent, integrated telephone and notification center, status management (pauses, breaks, etc), full-time or on-demand calling, and customized campaign creation to help agents make more calls in less time. Supervisor features include tools useful for case and employee management like real-time monitoring, and listen-in ability (spy, coaching, barge in). A dynamic dashboard set-up, control reports, online, email and SMS alerts and many more features give supervisors a 10,000 foot view and drill-down capabilities for reporting. uContact offers a comprehensive way of managing collections and recoveries with a specially designed solution to automate the collection process. It optimizes contact rates with debtors through automatic SMS notifications and pre-recorded messages. uContact’s customer service platform allows for management of unified interactions from several channels, providing comprehensive service management. uContact CRM, which allows agents to reduce call handling times with automatic CTI screen pops, identify callers, and route them to the right agent. With Contact Survey organizations can dynamically create surveys with decision trees and multiple options and then use the statistical reports to analyze the results and take actions. uContact also offers a complete suite of solutions for banks and insurance companies to improve the customer’s service with Omni-Channel support, optimizing sales and increasing the collection rates. Not sure uContact is right for your business? Use our Call Center software Product Selection Tool to compare other Call Center software solutions. Have questions? Call or email one of our unbiased Technology Advisers for a free consultation. Learn everything you need to know about uContact. Our experts will reach out to you shortly.